Meet the ruler of the Inhumans, Black Bolt, and his teleporting canine sidekick, Lockjaw, stylized as a Marvel Pop! two-pack. The duo is being released as a 2018 San Diego Comic-Con exclusive, and the figures stand 3 3/4-inches tall with the vital inclusion of forehead antennas that help them control their powers. Black Bolt is glow in the dark for nocturnal adventures requiring illumination and Lockjaw is depicted mid-teleportation. 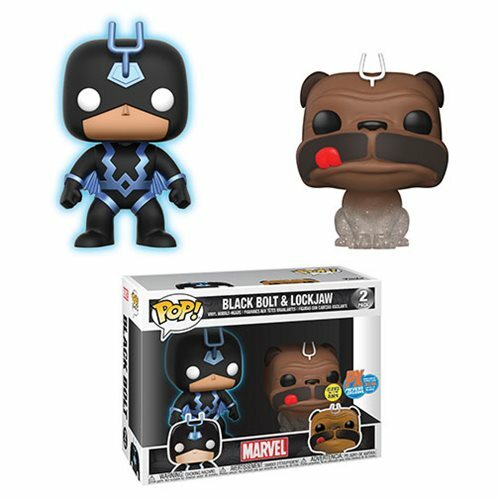 The Marvel Teleporting Lockjaw and Glow-in-the-Dark Black Bolt Pop! Vinyl Figure 2-Pack - SDCC 2018 Previews Exclusive is a limited edition of just 15,000 pieces worldwide! Ages 3 and up.